There’s a drowsy in-between period when I can hear the last few strains of her music although she’s lost in the leaves. When I fully awaken, I’m momentarily confused. I try to hold on to the peaceful feeling of the dream, but it quickly slips away, leaving me sadder and lonelier than ever. WHY DID I WAIT SO LONG TO READ THIS BOOK?! Ahem. That outburst accurately sums up my feelings about Suzanne Collins’ The Hunger Games, and I ought to leave it at that. But because this is a review, let me explain my enthusiasm. 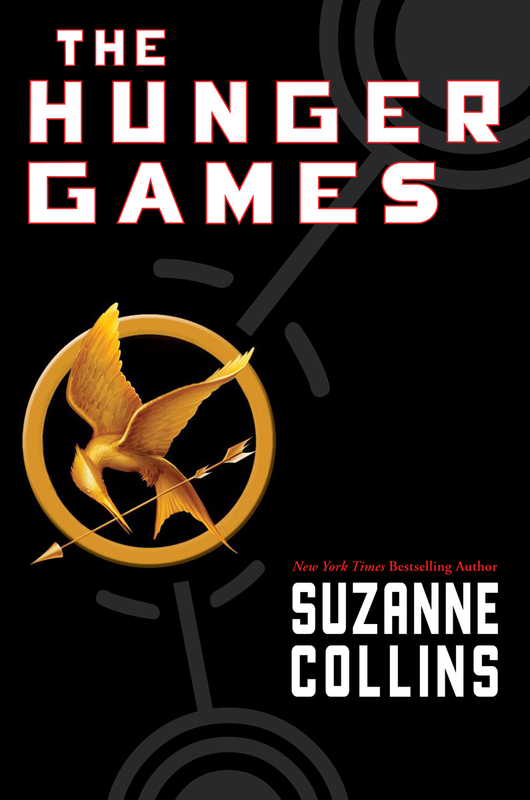 The eponymous Hunger Games is a Battle Royale for children — a televised sporting tournament that throws the rich and the poor, the untrained and the athletic, together in an open arena where they must survive against the elements and each other in a fight to the death. It’s also the biggest reminder of the Capitol’s power and how much control it wields over the twelve districts of Panem. The protagonist, Katniss Everdeen (yes, it’s a weird name, but there’s a reason for it), comes from an incredibly poor area called the Seam. Through memories and recollections that feel organic to the story (they’re woven in), Collins shows us how capable and battle-hardened the character is before she even enters the arena. Katniss watched her father die, cared for her innocent little sister when her mother’s mind and body succumbed to depression, and started hunting outside the district limits, beyond the fence — a pursuit that’s forbidden but so essential to the simplest human survival in Panem. Hunger is their oppression. Life is a little easier when Katniss meets with her hunting partner, Gale, but their relationship is strictly business and friendship. At least, it was. A trace of romance seeps into their talks in the woods just as the next annual Hunger Games are about to begin, and not Katniss or Gale but her little sister Prim is chosen, with a single odd against her. That’s when Katniss volunteers to take her place and her entire perspective on life changes — mainly, that she won’t have one for much longer. That’s the most fascinating part about The Hunger Games to me: the meanings of words. Survival, romance, killing, mercy. At first, survival is making it through another day of gnawing hunger in the Seam, and then it’s outsmarting your enemies and the ravages of nature in the Games. It’s owing someone and living for them, or being owed. Romance is thinking of love in terms of practicality — raising a child in a world where hunger is law — or putting on a show to give the citizens of Panem, the “audience,” the drama and excitement they crave, all to better ensure survival (popularity means sponsorship, which means more gifts during the Games). Murder (dare she use the word when the Capitol treats the Games as national celebrations) is the difference between killing an animal and killing a person, someone who could easily be a friend, and sometimes is. Or it’s ending a life when a quick death is preferable. Collins plays with these dualities and more, and she does it in a way that’s natural and perfectly paced, that’s ever urgent and deeply affecting, with a protagonist who’s both likeable for her strength and moral values yet hopelessly graceless in times of social need. For once of such talent and intelligence, Katniss is clumsy with words, clueless near boys, and faithless about her own abilities. But these flaws only make her more impressive — more real. Every time I was on the verge of tears (which was pretty often), I held them back because I knew Katniss would do the same. She had to. Perceived weakness is death in the Games. Some vulnerability is okay — that of love. Much of the Games veers toward Katniss’s fabricated romance with the boy tribute from her district, Peeta. To win the favor of the audience, they play the roles of star-crossed lovers, partners and teammates all while knowing one of their fates must be cut short, possibly by the other’s hand. There can only be one victor. Their relationship is always reminiscent of this pull and tug: enemies or friends, lovers or actors, Katniss is never quite sure. And at home, watching them onscreen, is Gale. Our curiosity about what Gale, her loyal and trusted friend, must be thinking is never answered. That awkwardness is tangible with each kiss or smile Katniss and Peeta share, but at times, when the moment is right, it vanishes completely. They experience a whole lifetime in that arena, and that’s something Gale can never match. But he and the Seam promise normalcy, or close enough to it, and Peeta is everything but. The second book, Catching Fire, should parse the truth from the fabrication, the genuine feelings from the ones born out of the instinct to survive. And I can’t wait to read it. The whole series is exceedingly good in my opinion. I really like the author’s style and she really has managed to create believable characters and a story that’s impressive to read. Sure, she borrows a lot from Battle Royale but still she manages to make a unique story of her own. Good to hear! It’s funny because we have Battle Royale sitting here on our shelves and I have yet to read it … it might be a good idea to once I’m done with this trilogy. I was late to jump on the Hunger Games bandwagon as well. The first book was pretty amazing. And, I’m kind of ashamed to admit I still haven’t read the second book, especially since I think The Hunger Games trilogy is a series worth reading all the way through. (I have such difficulties reading series when there are so many other worlds to visit). I’m especially kicking myself because I just saw Catching Fire yesterday in the theaters and it was AMAZING. I’ll be snagging the rest of the books before the year is out. I gotta know how the story ends.